Welcome to Applegate Home Improvements. We are a family run double-glazing and conservatory company who have been in the double glazing trade for over 35 years. Applegate Home Improvements offer a professional, honest service to design and install your bespoke Conservatories, Windows, Doors and much more. We realise that its not just the product that’s important, but the people who install it and the service that follows. We have a great team who will provide you with a helpful service. 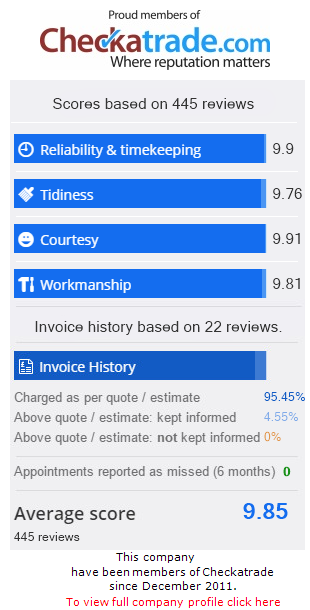 92% of our work comes through recommendation and to be recommended you need to provide the best kind of service. If you’re looking for new Windows, Doors, Conservatories, Bi Fold Doors, Fascia and Soffits in Surrey, Hampshire, Berkshire or Middlesex, you’ve come to the right place. See below for our scores on Checkatrade and click on the image to read the reviews. Our windows are of the highest standard, offering you and your family complete security and peace of mind. We design, supply and fit a wide range of door styles to completely match your every requirement. Whether it’s a little extra space, a garden room or a playroom, Applegate Home Improvements have got you covered. Very pleased with our conservatory, porch and back door. Lewis, the fitter, was a polite, respectful perfectionist!! Would highly recommend.